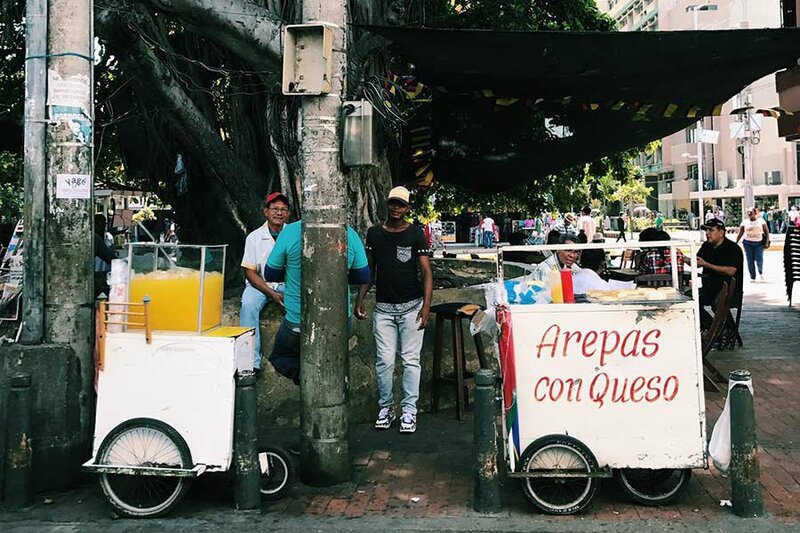 A fresh drinks cart and a traditional arepa cart. Photo by Tess Falotico. 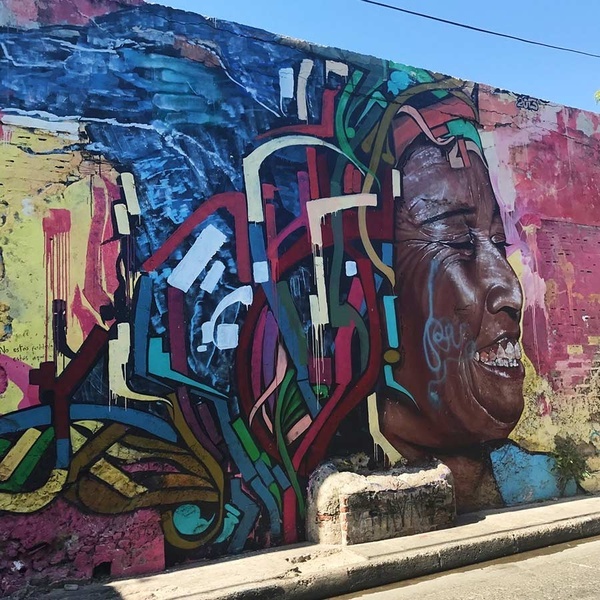 Fathom contributor Tess Falotico is still feeling the high of Cartagena, where she ate, drank, and shopped to her heart's delight. She makes it easy for you to do the same. Just follow along. CARTAGENA, Colombia – With its bright colors, strong cocktails, vibrant flavors, and pulsing music, Cartagena wraps you up in the best kind of 85-and-sunny sensory overload. My partner-in-crime and I wanted to visit a city that offered both rich culture and three-hour siestas, and Cartagena delivered. It was the perfect girls' trip. You could easily soak it all up in a long weekend (and subsist solely on ceviche and mojitos, for which we’d applaud you). A magical place where the ceviche is fresh and the mojitos are served in a bowl the size of your face. The creamy corn cake, which comes stuffed with beef, would be a shame to miss. Make a reservation — it's a favorite among locals every night of the week. This spot is no secret, so go on the early side for dinner to avoid a wait and enjoy your citrus-marinated, Bourdain-approved seafood in peace. Go for the palm tree-shaded courtyard seating. Stay for the fine-dining spins on Caribbean classics. Care for fermented pineapple, black tempura-crusted bananas, and lychee chimichurri with your seared snapper? Of course you do. Prefer your ceviche with tiger's milk and coconut smoke? You do now. At lunch, the whole shebang will cost you about $30 USD. After a night of drinking and 1 a.m. arepas, the juices at Beiyu, made with Caribbean fruit, are particularly refreshing. They also have Colombian coffee and healthy breakfast bowls. Where Colombian beans meet coffee-snob brewing methods. Can't wait to try one. 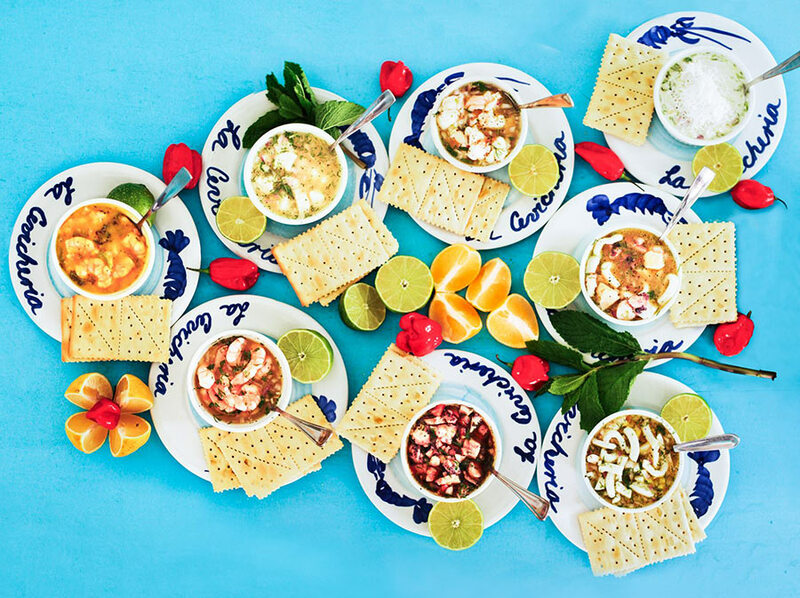 Photo courtesy of La Cevichería. You'll be surrounded by street art while taking a walk. Photo by Tess Falotico. An afternoon siesta will give you the energy you need to strut. Photo courtesy of Casa Relax. This square in Getsemaní is sleepy all afternoon, but by the time the sun goes down, it's packed with a mix of visitors and locals every single night of the week. People blast music out of their windows in the surrounding apartments and sell snacks on the side of the street. Bands play, kids play soccer, people dance — it's a good time. Hit any (or all) of the bars surrounding the plaza and grab a seat outside. The drinks here are creative and delicious. Your cute bartender will probably write his phone number on your check, and you will probably not be mad about it. There are tons of shops selling all linen everything, but this one is among the most reasonably priced. I left with a bare-shouldered white top that's as suited for dinner on Calle Del Santísimo as it is for a summer night at home in New York. There's one on every corner selling colorful woven bags and pom-pom sandals that are so on-trend right now and so reasonably priced. Getsemaní is full of B&Bs exactly like this one, which is situated around a courtyard. Amenities are bare-bones, but it's inexpensive and charming, and breakfast is included. 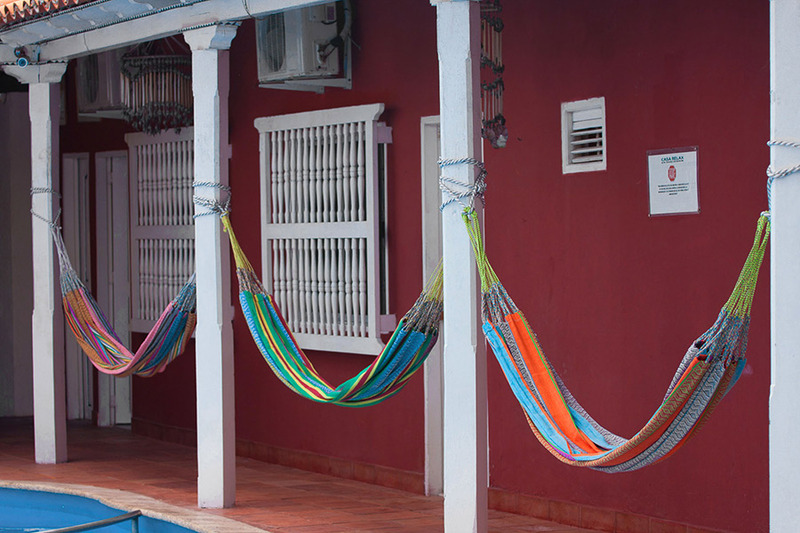 The poolside hammocks are ideal for an afternoon siesta.